Share the post "African Trees: Sausage Tree Or Kigelia Africana"
The Sausage Tree is sacred to many African communities. It also widely used in traditional and Western medicine, including commercially available skin lotions. But even with this quite tasty name, don’t eat from the sausage tree! The raw tree’s fruits are highly poisonous. There’s also another good reason to be cautious of the sausage tree – its famous enormous fruits, as when they fall, it can be a serious enough missile! Kigelia is a genus of flowering plants in the family Bignoniaceae. The genus includes only one species, Kigelia africana (syn. Kigelia pinnata), which occurs throughout tropical Africa from Eritrea and Chad south to northern South Africa, and west to Senegal and Namibia. You can also find this trees in Australia. 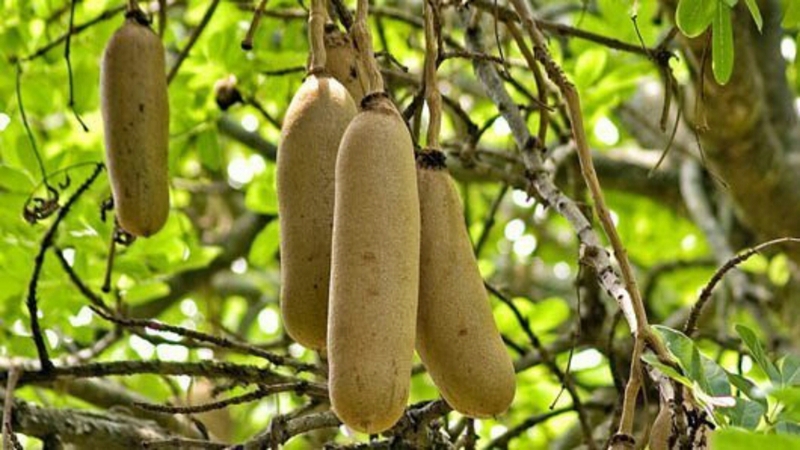 Names: the genus name comes from the Mozambican Bantu name, Kigeli-keia, while the common names Sausage Tree and Cucumber Tree refer to the long, sausage-like fruit. Its name in Afrikaans Worsboom also means sausage tree, another of its African names Moporoto, translates as a fat tail of a sheep, and its Arabic name means “The father of kit bags”. In Hindi it is balam kheera, hathi bailan. Description: the tree is evergreen where rainfall occurs throughout the year, but deciduous where there is a long dry season. The Sausage Tree grows up to 25 meters tall. The tree’s bark is grey and smooth and flakes in older specimens. The tree flowers from August to October and fruits from December to June. 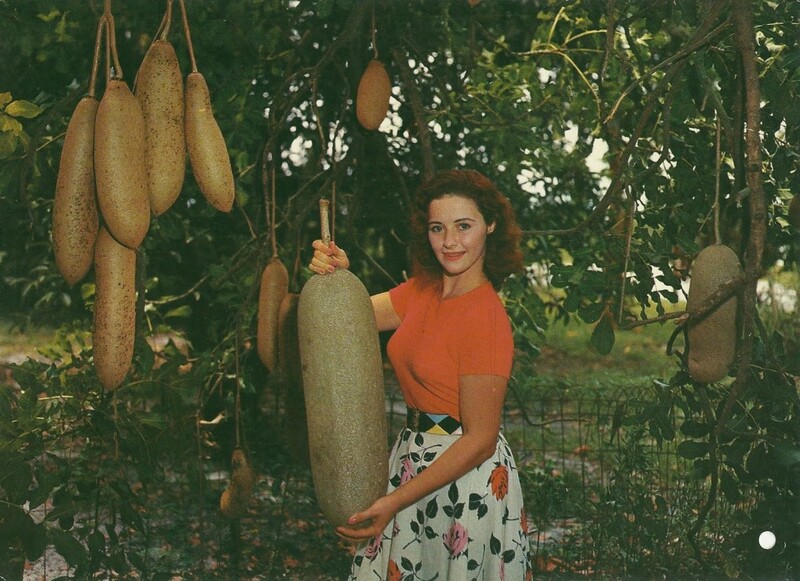 The adult sausage tree has spectacular fruits, which is a woody berry from 30–100 cm long and up to 18 cm broad; typically it weighs between 5 and 10 kg, and hangs down on long, rope-like peduncles. The fruit pulp is fibrous and pulpy, and contains numerous seeds. The fruit, while not palatable for humans, is popular with hippos, baboons, giraffes, monkeys, porcupines, birds etc. The bell-shaped flowers of the Sausage Tree are also quite showy, hanging on elongated, flexible stems. Petals are a deep, velvety red with yellow veining on the outside. Flowers are very long lasting, and can remain in bloom for up to two months. This makes the species a popular exotic choice for large, landscaped gardens in suitable climates. The scent of the flowers can be smelt most powerfully at night. It is fairly unpleasant to people, but it is very attractive to bats, which are the main pollinators of this species. Leaves are crowded near the tips of branches, and young leaves are brownish red. They are eaten by elephant and kudu, and are used in parts of Africa as fodder for domestic livestock. Habitat: riverine forest, wooded grassland, savanna and forest margins. Growing environment: grows well in full sun. Needs moderately regular water, though it should be reasonably drought hardy. Hardiness: marginally subtropical and can stand some frost and temperatures to 28F. Uses: In some African tribes, the Kigelia Africana is worshipped as a holy tree. Village indabas (important meetings) are held at its base, and relics carved from the wood are revered. Masaai girls carry dolls made from the pods. In the Ndebele tribe, if a family member dies far from home, a Sausage Tree fruit will be buried in place of the body. The tree is also believed to contain powerful medicine to ward away evil-spirits. The sausage tree’s fruits are used to make a traditional beer enjoyed by the Kikuyu people. In order to make the fruits safe for beer brewing, they must first be sun-dried, then fermented with sugar cane juice for around 24 hours, then dried again, before finally being added to a large barrel of sugar cane juice, where they’ll ferment it for around four days. The final beverage should taste sour, smell boozy, and hopefully not act as an immediate emetic (at least when consumed in moderation). Besides being drunk, the beer is also commonly used as a soothing bath for children suffering from measles. Tall, with smooth grey bark and beautiful, bell-shaped flowers, the kigelia tree is often cultivated ornamentally. There are also a range of traditional uses for the fruit, varying from topical treatments for skin afflictions, to treatment for intestinal worms. There are some steroid chemicals found in the sausage tree that are currently added to commercially available shampoos and facial creams. Some of the myriad health problems treated with extracts from various parts of the tree include malaria, headaches, syphilis and other venereal diseases, rheumatism, inflamed spleen, ulcers, and gastro-intestinal issues. The fruit is known to have anti-microbial properties, and is thought to help with skin problems like eczema and psoriasis. It often even makes its way into high-end anti-aging and beauty products! Sausage tree wood is extremely useful. It is exceptionally strong, water-resistant, and doesn’t crack easily. It is used to make ox-yolks, canoes and oars. Let us know in the comments below if you’ve seen this tree and if so, then where! 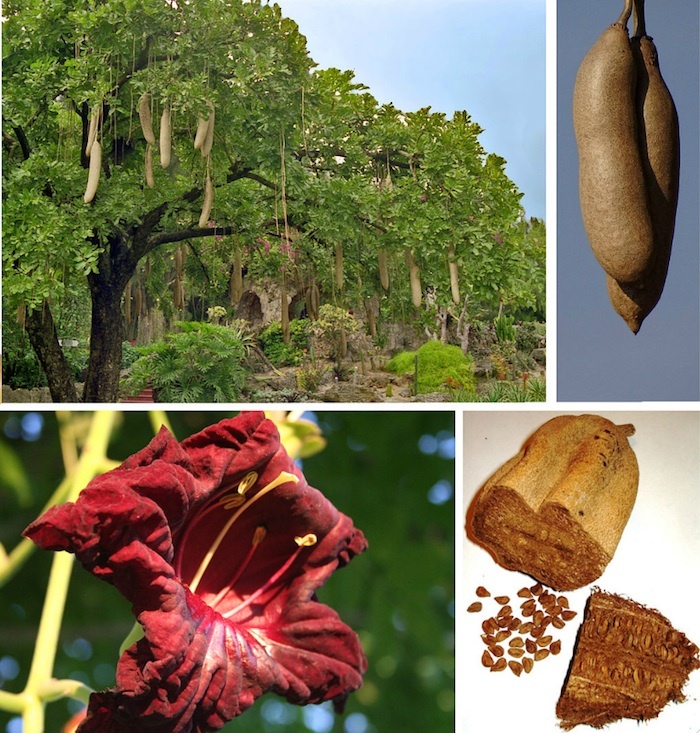 Do you sell Kigelia Africana (Sausage Tree) seeds or have plants for sale? You can place your advertisement here. Contact us now!